It’s been a VERY GOOD WEEK! A very good week indeed! Guess who got herself a big girl job?! That’s right, ME! Clay Pigeon Winery will be opening its doors to the public pretty soon and with it will be their wine tasting bar called Cyril’s. I’m going to be cooking there as their chef full-time and it’s going to be awwweeesooommme. I’m in the midst of menu planning and such and it’s been a ton of fun already. It’s going to be kinda chaotic around here for a couple of weeks, but guess what else!? I can start baking for all you happy bread loving folks right from the wine bar. You might even be seeing my bread on the menu. The place is still under construction so I have yet to actually see the oven in all it’s glory but chances are it’s bigger and better than what I’m cooking in now. Sooo, with that said there might be a few changes around here in terms of delivery times and days but I’m not sure what those changes, if any, will be at the moment so enough of that for now. Anyway, I hope you will all come in for a glass of wine or beer when we open, and maybe even order an appetizer or two. I’d love to see you. Last week’s spiced delicata squash bread had mixed reviews. I hope most of you liked it! Perhaps the chipotles were a little “out there” for some of you folks, so I apologize if it wasn’t to your liking. I thought it was great, but everyone’s palettes and preferences are different. I’m glad you all at least tried it and are such good sports in letting me choose what you eat each week, you’re awesome! I never expect everyone to like every bread I make 100% of the time, but lesson learned, maybe I won’t use chipotles again in the future. With that said, this week I’m going back to something a little bit simpler and “normal” in terms of bread. This week’s bread was inspired by Kim Boyce’s multigrain flour mix she uses in her cookbook, “Good to the Grain”. Have you all ever been to her store front, Bakeshop here in PDX? I’ve stopped in there once upon a time but I never did order anything. Her cookbook is lovely though as are most of the recipes in it. I have made her waffles using this same multigrain flour mix and they are delicious! So what’s in it? Well, let’s see here, there is whole wheat, millet, rye, oat, and barley flour all mixed together combined with a bunch of white flour too and what you’ve got is a pretty darn healthy and delicious loaf of bread. I don’t have a photo of it for you all, I used the last of my test loaf making some bread crumbs for part of tonight’s dinner. Speaking of breadcrumbs, here is a very simple recipe for you all in case you have some staling bread that you just can’t seem to part with to the compost demons…. -Cut off the crust from bread, cut the bread into cubes and process in a blender of food processor until the crumbs reach the fineness you want. 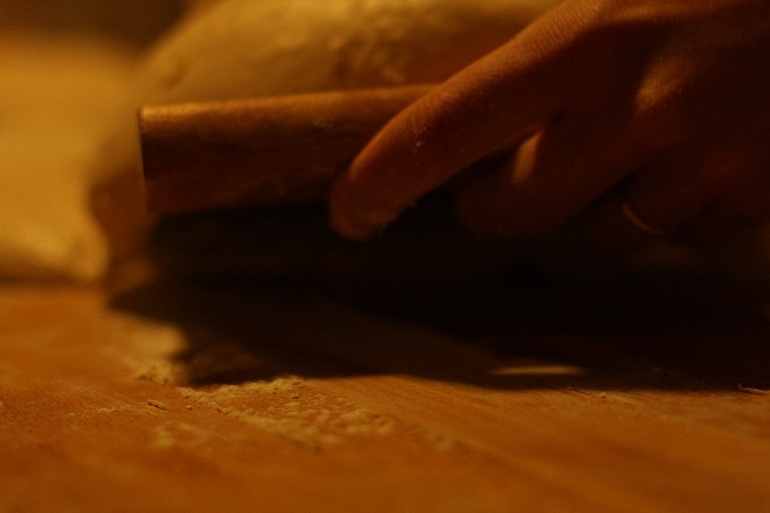 -Toss breadcrumbs with salt + oil and spread the crumbs on a baking sheet in a thin layer. -Bake until golden brown, stirring the crumbs every few minutes for even browning. -Fry a handful of herbs in hot oil over medium heat until crisp, drain well and toss together with the toasted breadcrumbs and a pinch of salt, if needed. -A few dried chili flakes can be mixed into the crumbs for spice. -Freeze the breadcrumbs before you toast them. When you need them, defrost and proceed with recipe. Frozen breadcrumbs will stay fresh in the freezer for months. 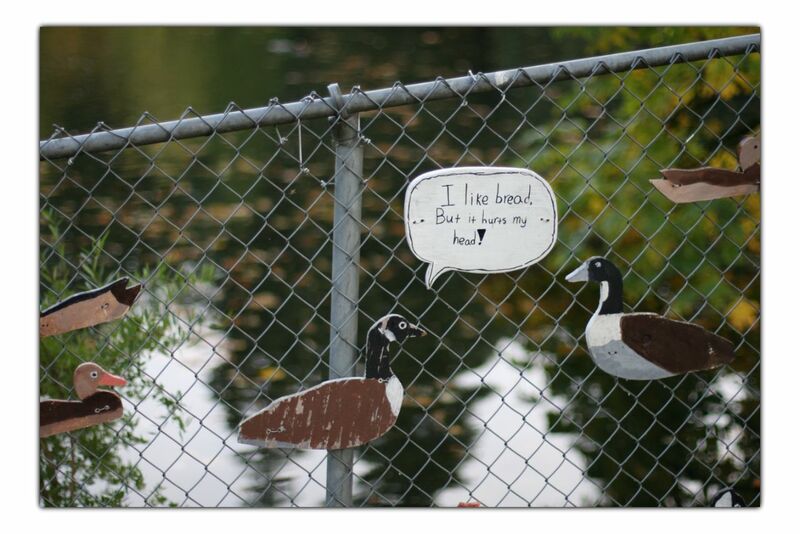 And I will part from you with this picture I took in Laurelhurst Park the other day, it made me laugh. In case you didn’t know, don’t feed ducks bread, it’s bad for them! 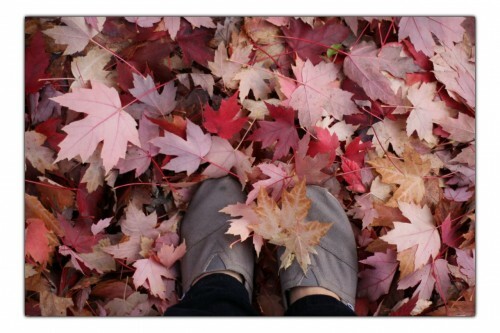 No job hunting all day anymore means I can do FUN things like take photos in the park of my feet in leaves and sleep in late in the morning. Yippeee!